Analist is a CAD based on the AutoCAD technology it therefore has all the advantages of the Autodesk graphical settings and functions. You can also personalize the interface which can based on the latest Autodesk formats. 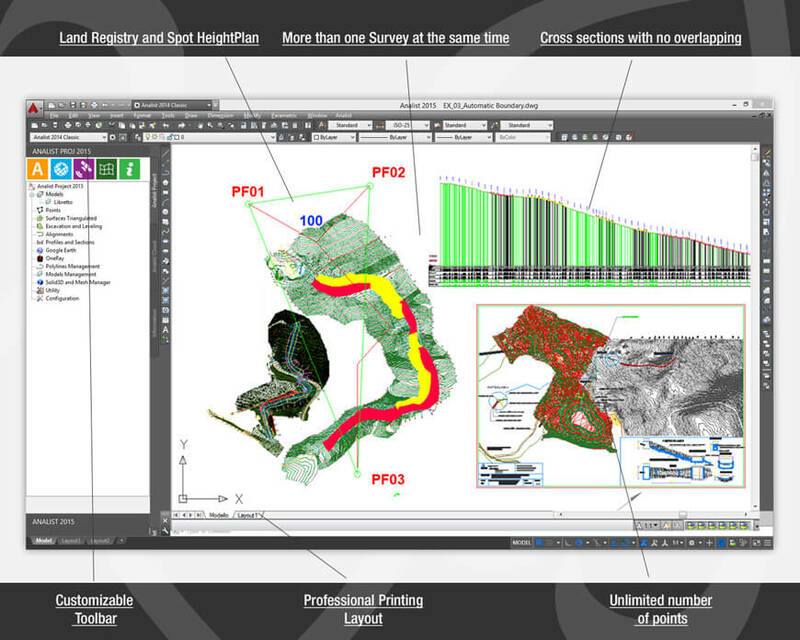 The CAD features are enriched with specific topographic survey functions. 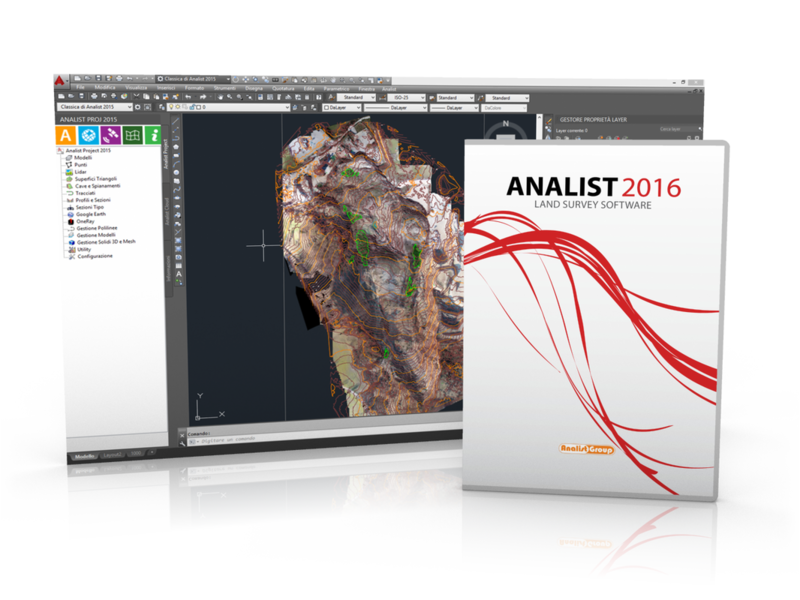 Analist and the majesty of the Autodesk CAD available to you in 3 versions: Analist 2016, Analist 2016 CLOUD and Analist for AutoCAD. Choose the best Solution for your requirements. Start working on your projects most efficiently and professionally. 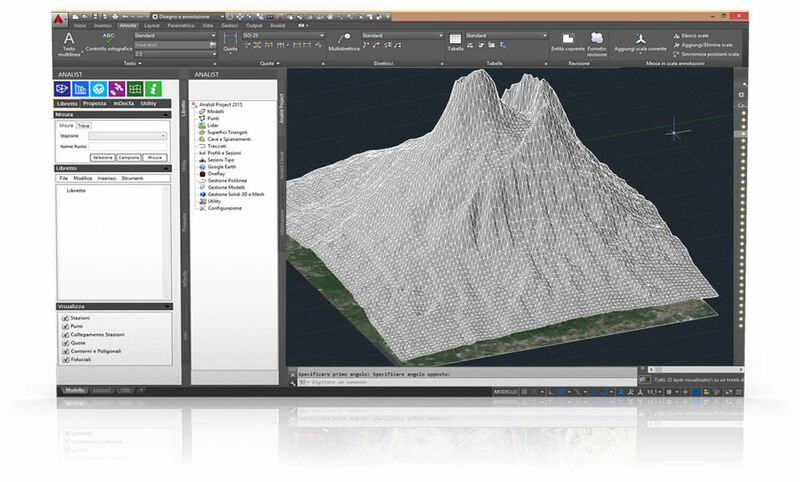 Land Survey Add-on Software for Autodesk AutoCAD. It requires Autodesk AutoCAD. Available for AutoCAD 2011, 2012, 2013, 2014 and 2015 versions. The new Technology based on the Point Cloud from aerial imagery (DRONE) opens up to great new opportunities in terms of execution speed and result accuracy. Whether you are interested in a Building Front estimation or whether you want to trace Cross Sections or Terrain Prospects, now , Analist Cloud enables you to work at the highest speed with the highest level of accuracy directly on your Point Cloud. 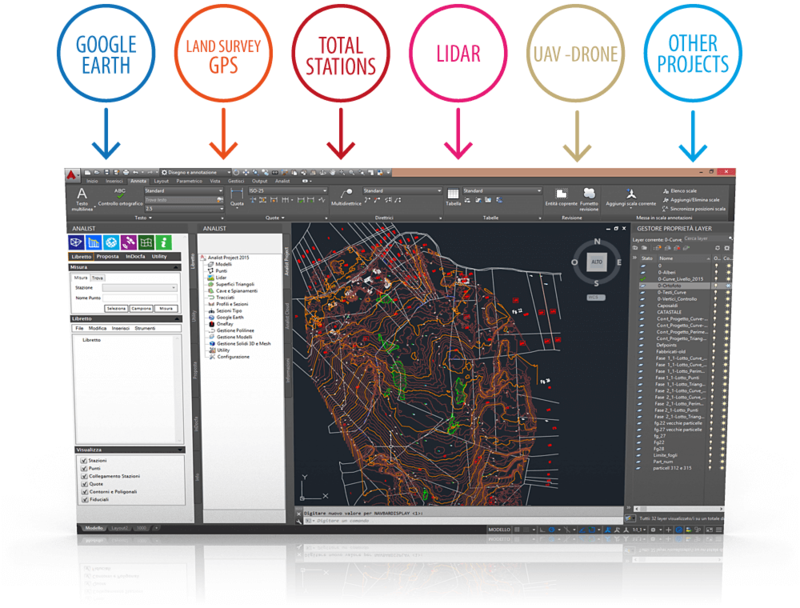 Analist CLOUD has been devised to handle huge quantities of data and for this reason it is the ideal tool for complete management of of the Point Clouds generated following a flight with a DRONE, Laser scanner or other instrumentation with Pix4Dmapper or Autodesk Recap. With Analist CLOUD you can also produce professional Print Layouts which automatically update every time you edit your Project. Power and aesthetics together at last: present your Projects like never before. Analist imports all data obtained from Total Stations, Land Survey GPS, DRONES, LIDAR and it is even able to import data directly from Google Earth. In addition to these, Analist can import projects created with other softwares. Unleash your imagination: you'll be able to perform the unthinkable... And what's more, working with imported data has never been so simple and immediate. Still don't believe it? Check it out! With the new Analist CLOUD Explorer, in addition to visualizing a Point Cloud in a LAS file format it is now possible to carry out distance, angles and areas measurements extremely easily and carefree. 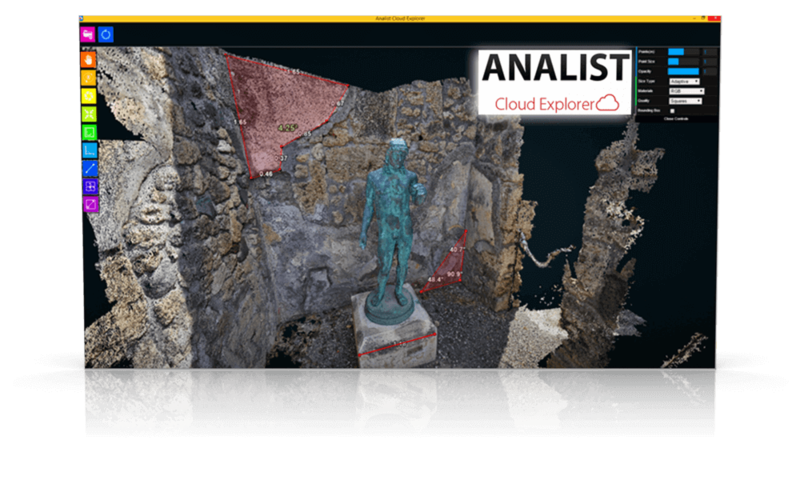 Analist CLOUD Explorer allows you to scale your Point Cloud (.LAS) by simply identifying and providing one measurement only. Thus it is possible to carry out the measurements you wish directly in the Point Cloud.Do you want to create Point Clouds from your photos? You can do it with Pix4Dmapper!Analist CLOUD Explorer is the newest function included in Analist 2016 CLOUD. New horizons, new Business opportunities. Have you ever thought of using a 3D Printer? New Analist 2016 is ready to be used with 3D Printers! 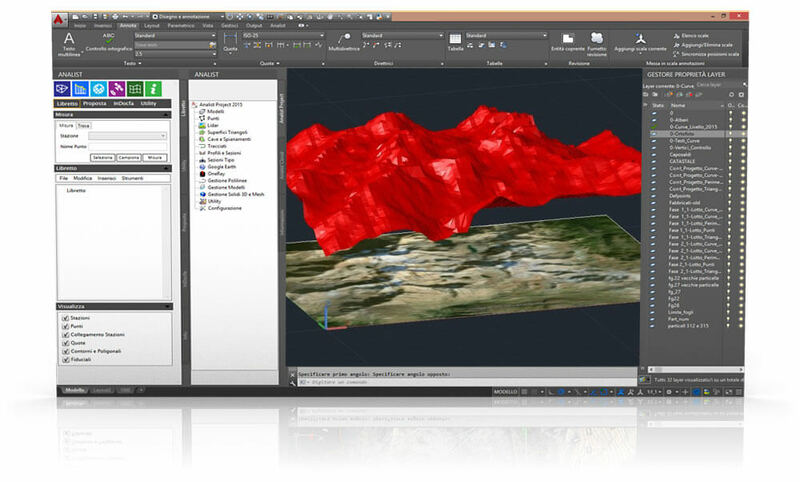 Creating digital topographic models suitable for 3D Printers will be most simple. You can now also offer your customers 3D Models: they will be elated!